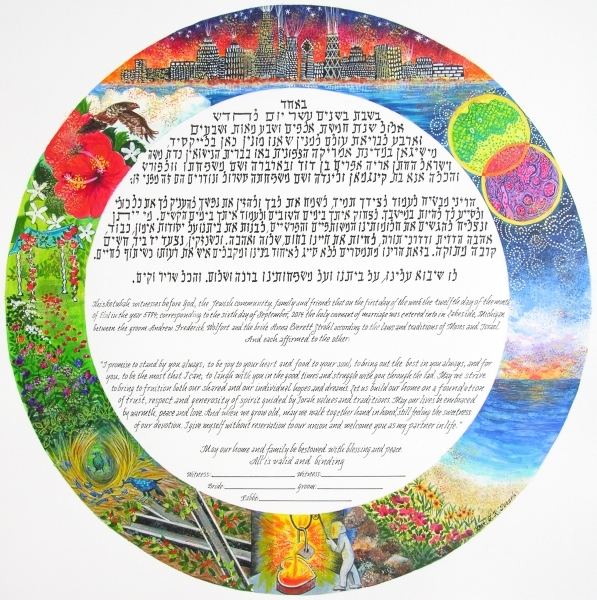 I enjoyed transforming the story of a couple, Anna and Andrew, into visual motives for this ketubah (Jewish illustrated marriage contract). Andrew works in his family’s steel business. Casting steel is a wonderful metaphor for creating a new, strong relationship. Thus, the foundation of this design is the glowing forge, where a steelworker is pouring molten metal into the mold of a heart. The forge also symbolizes the hearth, source of warmth and sustenance in the home. Extending the “building” metaphor, reading counter-clockwise from the bottom, there are steel girders, followed by a pair of bower birds. The male of this species creates an elaborate nest, which he decorates with colorful bits of paper and plastic, in hopes of wooing a mate. So romantic! Above the birds is a huppah, symbol of the home Anna and Andrew will create together. Flying above the jasmine and hibiscus flowers is a hawk, a personal symbol for them. Chicago’s majestic skyline at sunset surmounts the circle. Continuing the circular motif are golden rings: wedding bands, symbols of eternal love. Here they double as microscope lenses, through which we see slides of healthy breast and cervical tissue. This represents Anna’s profession as a medical doctor, specializing in women’s health. Returning to the personal narrative of Anna and Andrew, the circle is completed with a Lake Michigan sunset, as seen from the eastern shore, where they go to relax and unwind. Finding a way to incorporate such disparate elements as the steel industry and gynecology was a wonderful challenge! Anna and Andrew gave me free rein, which helped me fulfill the commission while allowing my creative stream to flow, unimpeded. When Fort Sheridan was developed as a residential community, a grant enabled the creation of the Openlands Nature Preserve. This project is a restoration and preservation of one of the last remaining ravine and bluff ecosystems in the metropolitan region. There are beautiful walkways, complemented by original, site-specific works of art. Interpretive signs illuminate the environment and the art with poetry by Lisa Roberts, who curated the art selections. The works are by Kate Friedman (Reading The Landscape), Vivian Visser (a driftwood installation called Erode), Ginny Sykes (a mixed-media mural on an underpass called Arc of Nature), Sharon Bladholm (cast bronze/resign plaques on a stone wall called Soil: Alive With Life) and Olivia Petrides (painted obelisks called Leaf and Earthbark Prisms). The ravine walk is wonderful, a gentle incline down to a beautiful beach. The art is a perfect complement to the environment. It serves an educational function while enhancing our experience of the beauty and complexity of nature, and our place in it. Sometimes art as “earthworks” is a destruction or disruption of the natural environment in which it is placed. Not in this case. I look forward to returning to the Openlands Preserve and spending more time with the art, particularly the poetry that accompanies each visual art piece on a trail marker.